Opening Friday, October 3, 2014, at 7 p.m., and on view through November 1, 2014, Counterpath host an exhibit of recent work by Albert Chong, “The Photomosaics: Works on Paper, Wood, and Stone.” The work consists of image transfers onto gridded ceramic or stone tiles that combine to make up a larger image. 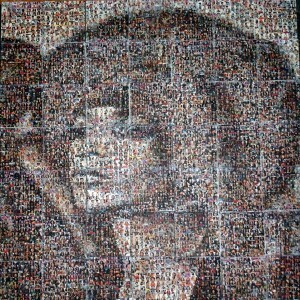 Included are blatantly political portraits of presidents George W. Bush and Barack Obama, made from portraits of thousands of dead soldiers, to a portrait of activist and former Black Panther Party member Angela Davis, her iconic afro consisting of thousands of portraits of African American women with processed hair. Photomosaics have the mass and presence of sculpture and the transmissive abilities of photography. Albert Chong was born in Kingston, Jamaica, and immigrated to the United States in 1977. He began exhibiting his work in 1981 and has been included in over sixty group exhibitions and had seven solo exhibitions. Chong taught at the School of Visual Arts in New York from 1986–1988, and at Mira Costa College in Oceanside California from 1989–1991, when he accepted his current position in the Art & Art History Department at the University of Colorado, Boulder. His work has been shown at The Venice Biennale, The Museum of Modern Art, The Havana Biennal in Cuba, and Kaoshiung International Container Festival, Kaoshiung, Taiwan, among other venues. Chong was Jamaica’s representative at the Sao Paulo Biennal in September of 1998, and he is the recipient of several artist fellowships, including a Guggenheim Fellowship in Photography, a Pollock/Krasner Grant, and two NEA Fellowships in Photography. He was commissioned by Absolut Spirits Company to create the work Absolut Chong as part their ongoing artist series. A book of his photographs, Ancestral Dialogues: The Photographs of Albert Chong, was published by the Friends of Photography in San Francisco.